I loved RTM when I tried it, but didn't like that I had to subscribe. Instead, I've been using www.toodledo.com, which also syncs with the iPhone and my iPod Touch (via a one-time fee app), and integrates with Gmail and Google Calendar. I need to be more disciplined in using my TODO lists. Currently I use google calendar, with different calendars for different aspects of my life (personal, hobby-related, ...) with shared access to my wife's calendar (if only she would use it more, not just the paper calendar at home... I guess I'll have to show here the advantages again). I also used google calender and Scott and I sync our calenders as well. I find that feature and the email reminders great. I think the system is more important than the tool. 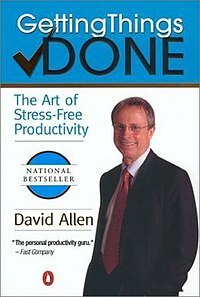 I highly suggest Getting Things Done: The Art of Stress-Free Productivity by David Allen. His system has somewhat of a cult following, particularly among IT people because it's very systematic. It's all about reminding you what you have to do at the appropriate time. I'm old fashioned and write things down in a weekly planner that I carry in my purse. What are some good audio books for parents?